I have recently been hearing a lot about SimCity Social, the “Farmville with a candy coating of SimCity” game from Bigfish and EA. Mostly I’ve heard about how the game pulls all kinds of tricks to get players to spam each other, trade items, recruit new players, and spend real money. All of these things are par for the social game course, but apparently we have a more egregious than usual offender here. 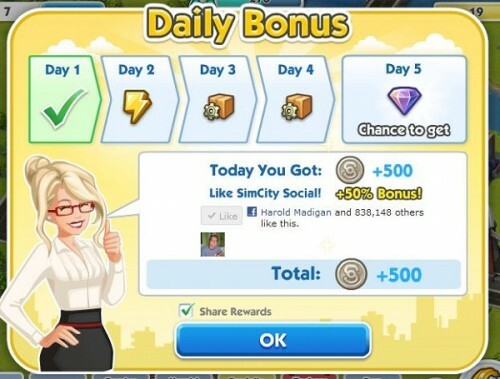 So I decided to investigate what psychological tricks SimCity Social pulls by forking over all kinds of pervasive permissions to my Facebook account and trying it out. Wow. There’s so much going on here that within a few seconds I blacked out and woke up some time later in a puddle. I don’t know how this happened. What I do know, though, is that SimCity Social wears many of its machinations on its custom tailored sleeve. I counted seven pretty much immediately and decided to stop there, because I love alliteration and had this great idea for a blog post title. The convenient thing is that these are all things I’ve written about before, so instead of going into depth on each I’ll give you the gist and then point you at other articles if you want more. Reciprocity is the impulse we feel to return favors, and it’s a pretty fundamental factor in human society and psychology in general.1 Whenever you get a free sample at the supermarket, the nice lady in the hairnet is banking on reciprocity to at least listen to her enthusiastic description of this new snack cracker if not buy a box right then and there. Famed psychologist Robert Cialdini explained in a 2001 article in Scientific American how the Disabled American Veterans organization used reciprocity to increase the success rate of their mail-based fundraisers from 18% to 35% simply by free return address stickers as a tiny gift with each appeal. 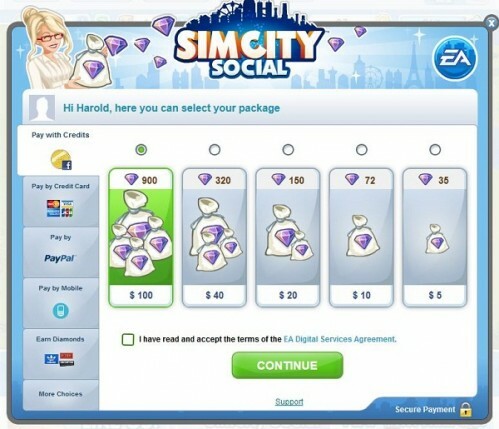 SimCity Social has gift trading baked into almost every aspect of the game. You can, once a day, gift other players with a few resources. If you’re low on specific resources –say a scientist to staff your research lab– you can request them as gifts. And you get points for every gift you accept. The game makes it easy for you to return the favor, and each exchange sends you a Facebook notification that prompts you to launch the game and keep playing. Non-players can receive gifts too, provided they first install the game and start playing themselves. How Reciprocity Yields Bumper Crops in Farmville. Like most “wait to play” games, SimCity Social lets you spend real money to accelerate the game and get past the time and resource restrictions. Need more “bliss” to finish construction of your toy factory? I don’t know what “bliss” is, but you can get out your credit card and buy some! But, of course, you can’t just charge stuff straight to your card. You have to buy some of the game’s currency, little purple diamonds, and then spend those. The problem is that like travelers spending money in a foreign currency, spending purple diamonds makes you susceptible to several biases and errors in thinking, ranging from being too lazy to do the mental currency conversions, to applying different (and irrational) mental accounting to diamonds than you would real money, to overspending unused diamonds because you don’t want to “waste” them. Let’s stick with the little purple diamonds for a minute. When you click to buy some, you’re presented with six different denominations you can buy, ranging from 900 diamonds for $100 to 35 diamonds for $5. Notice in the screenshot which of those options is selected by default, though: the most expensive one. This is designed to take advantage what’s called the status quo effect, which describes our tendency to accept default settings, decisions, or options rather than make the often trivial effort to change them. This is especially true in ambiguous or cognitively demanding situations. For example, in one study,2 researchers were able to drastically increase the number of employees who participated in a savings plan just by requiring them to opt out of the program rather than opt in. Similarly, more people shopping for diamonds should go with the default choice of 900 for $100. Of course, many of you may be thinking that this is too extreme to work in most cases; most people are looking to spend just a few bucks, not $100. And you’re probably right, but SimCity Social uses the status quo effect elsewhere as well. 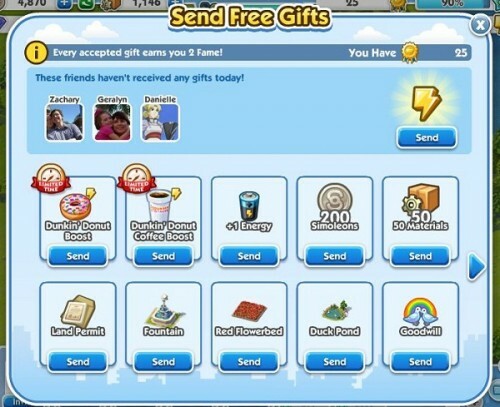 Whenever you have to confirm sending a request to another player via Facebook, the system automatically checks a box that says “Don’t ask again before sending requests to [NAME] from this app.” When you accomplish something in the game, it often throws up a notification that includes the ability to “Share Rewards” to your Facebook wall after you click “OK.” This is, of course, selected by default as shown in the screenshot above. Sometimes we just want something because we soon won’t be able to have it. This is known as the scarcity effect. Consider a simple 1975 experiment by psychologist Stephen Worchel3 where researchers offered subjects a chocolate chip cookie from one of two jars. One of the jars had many cookies in it. The other had only a few. In reality, they were THE SAME COOKIES but people reported the cookies from the mostly empty jars as more delicious, more desirable, and more expensive. Just because they were more scarce, and our brains are wired to be averse to losing the option to have something once it’s available. Once we get started down the road to a goal, we’re reluctant to give it up. This is a great hack you can use to motivate yourself to reach goals, but it can also be used against you. And what’s more, it turns out that we’re super susceptible to suggestions that we have already started an undertaking, even right off the bat. My favorite example of what’s called the endowed progress effect is a 2006 study by Xavier Dreze and Joseph Nunes4 where they gave half the customers at a car wash a rapid rewards card that required 8 total stamps to get a free wash. Others were given a similar card that required 10 total stamps, but were given two freebie stamps to get them started. So both groups needed only 8 more stamps, but the one that got kick started with the two freebies were more likely to come back for future visits and to wait less time between them. 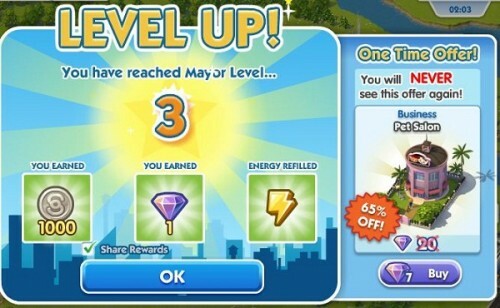 SimCity Social leverages the endowed progress effect in a few ways. Upgrading building requires various resources, but you’ll often have at least some of these before you start and will thus immediately see something like “2 of 20 hard hats” when you check the progress of your upgrade. 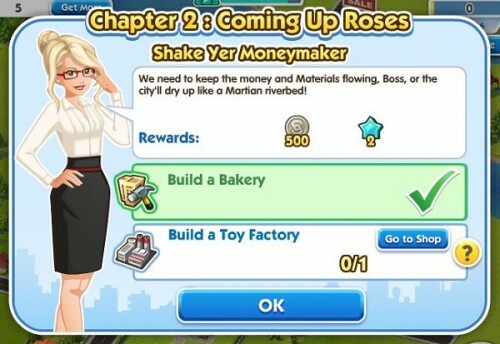 Each game chapter also has multiple, specific goals for completion (e.g., “Build a Bakery”) and I found that I had often already satisfied one of those goals in the course of messing around on my own. Many things can make an event easier to recall from memory, including seeing it happen to friends. SimCity Social capitalilzes on this by encouraging you to spam the living daylights out of your wall with notifications of things that you’ve done in the game and the fact that you’re playing the game in the first place. Friends who see these notifications recall them more easily and are thus likely to overestimate the popularity of the game when they see an ad or receive an invitation to play. Social comparisons are, unsurprisingly, important to social games. This includes that old standby, envy, especially what’s been called “benign envy.” As opposed to “malicious envy” where you want to tear down the other person and take away their pretty shiny thing, benign envy is elicited when we think that a person deserves what they have because they earned it. Benign envy motivates us to improve ourselves (or pay money) to get the same rewards. In one study5 researchers instilled benign envy in a group of college students by having their friends earn a new iPhone. As a result, subjects said they were willing to pay 64% more to get their own iPhone. 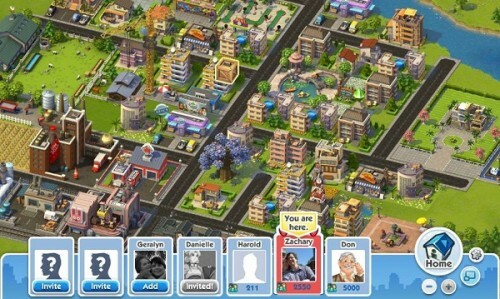 SimCity Social capitalizes on benign envy when you visit other players’ towns. You can see everything they have built and bought. What’s interesting (and probably the most amusing thing about the game) is that you have the option to be either kind or mean to them as you click on all their stuff. You can “knock over display stands” in their stores, or you can “compliment the decor” when you visit their Mayor’s home. You can even send either hot air balloons across their skies, or a flock of incontinent seagulls. And, of course, if you experience benign envy over their accomplishments and layout, you may be more motivated to recruit more friends or buy some of those purple diamonds to keep up with them. 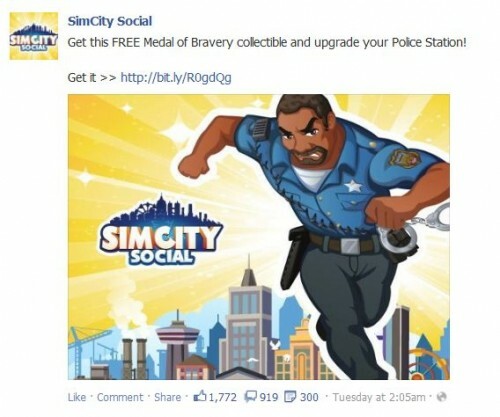 So, there you go: my epic post on the psychological shenanigans of SimCity Social. I’m not saying Playfish set out to brainwash you –these are old design principles and the people who make videogames tend to be smart so they figure out and remember what works. Nor are they unique to SimCity Social, in that most of them apply in one way or another for most social games in this vein. But if you decide to engage in a little urban development on Facebook, everything above is good to keep in mind. P.S., Thanks to readers Zachary and Danielle for stepping up and accepting the friends request to play the game with me and pose for some screenshots. 1. Cialdini, R. (2001). The Science of Persuasion. Scientific American. February 2001. 3. Worchel, S., Lee, J., & Adewole, A. (1975). Effects of supply and demand on rating of object value. Journal of Personality and Social Psychology, 32, 906-914. 4. Nunes, J. & Dreze, X. (2006). The Endowed Progress Effect: How Artificial Advancement Increases Effort. Journal of Consumer Research. 32, 442-52. Interesting observations. I just don’t like the way you call them as “sins” and “tricks”. It’s the video game industry afterall. Fair enough. I deliberated over the “sins” word since it obviously has other connotations, but ultimately I liked how it worked in the title. Mea culpa, but I hope the body of the text speaks objectively enough. Why must it be objective though? It seems to me that much of this revolves around making the players feel bad about not playing (or buying/spamming/etc), rather than making the game itself enjoyable. Are those really equally ethically valid goals as a game designer? Not saying it must, just that I chose to here. Game designers can certainly debate the ethics. Great site BTW. Psychology is a very fascinating subject, and it’s interesting to see how it relates to our particular hobby. I liked the one with free stamps. Interesting. Don’t forget variable reinforcement ratios keep players coming back to do actions for a chance to get “collectibles.” it is like a slot machine. That fuels players to use up their energy and either buy more or come back later. That said, it is fun to attempt to optimize population centers. And there are ways to trick the game into NOT annoying everyone and their mom. These so called “sins” and “tricks” apparently are targeting stupid people. If you’re stupid enough to fall for them then you’re the problem not the game. You can play this game for free, without spamming any of your friends, and entirely at your own pace. If you’re smart. If you’re stupid you can waste your money, annoy your friends, and stress out to compete in a video game on FB. as a psych major, i enjoyed this article, and can see how the general public of facebook users can easily fall into these categories. im glad to say that i have not yet really fallen for any of these “tricks” (at least not yet). the game is quite addictive i must say, but ive been able to get far without buying any diamonds. though there are ways of getting diamonds through their offers (like signing up for a service like netflix, or completing a survey). the only times i feel like i need to finish a quest ASAP is when it’s timed (as in, you have a week to finish it, otherwise you will have to spend diamonds to get the buildings they are offering free if you finish the quest). The selection of $100 being the default also automatically makes the other options seem that much cheaper in comparison.